Resigned Congress MLA Hmingdailova Khiangte has joined the National People's Party and will contest from Tuirial AC in Mizoram. Resigned Congress MLA Hmingdailova Khiangte has joined the National People’s Party and will contest from Tuirial AC in Mizoram. He was elected as MLA from this constituency for two consecutive terms but the Congress left him out for the coming Mizoram polls. NPP national observer S Ghatraj told Northeast Now that Colney was approached by his party after he was left out by the Congress. “Sympathisers in thousands are still favouring Colney and his wave has became a major force in Tuirial AC. 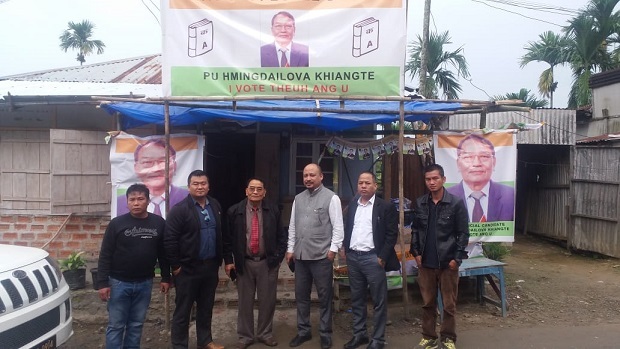 The response and support to Hmingdailova Colney from the people of the constituency are enormous,” S Ghatraj said. “The people of Mizoram have acknowledged our party. The ideals of our party and the fact that we have been working for tribal across the region have a positive impact on the people of Mizoram,” Ghatraj added. A retired IPS officer Hmingdailova Khiangte was elected as MLA from Tuirial AC in 2008 defeating the sitting MLA Sailothanga Sailo. He was made the chairman of Mizoram Youth Commission. He was re-elected again in 2013 from the same constituency in 2013 and was appointed parliamentary secretary. Disgruntled by his exclusion from the party official candidate list of the Congress he tendered his resignation from the Congress as MLA to join the National People’s Party.